Vintage 1920s long necklace of striped beads. 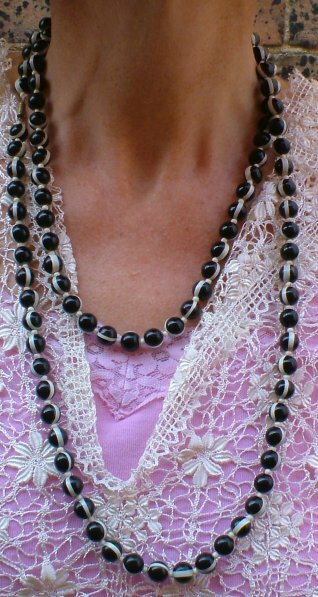 Here is a glorious, long flapper necklace of black and creamy-white striped beads - similar in style to those in all the shops this season, with the advantage of being original and unique! 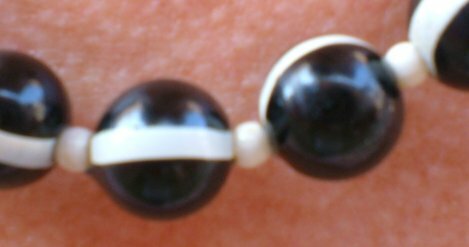 The stripe does not always exactly bisect the bead, which leads me to believe them to be hand made. Each is separated from its neighbours by a tiny bead in the same shade of cream. There are 109 of the large ones! Generally speaking, the necklace is perfect, though there are one or two little flaws in a couple of the beads. The clasp is sound, and really, considering its age, this is a spectacular object! Wear it wound three times round your neck, or loose - it's gorgeous! Length overall is approximately 51 ½ ins (131 cms).